Research in HCI must move away from technology as a solution to behavior change towards a model that enables users to be active agents in the feedback mechanisms embedded in ambient, ubiquitous and gamified interfaces. How might we be able to design computer and technology-based systems in order to change behavior? 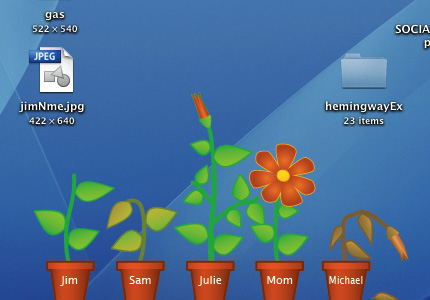 In part, these appear to be motivated by individuals whose approach to HCI is driven by the desire for computers to do good for the world (e.g. be healthy/be green). Doing good means enabling individuals to take action so that the effect of the collective masses is measurable. Enabling individuals means leveraging the very technology they already own (increasingly, smart phones, laptops) in innovative ways. HCI research seems very eager to jump on this technology as a way to incentivize and motivate users, but I believe we could steal a page or two from those who design specifically for behavior change. BJ Fogg, a prominent researcher in the field of persuasive technology, framed it elegantly in his Fogg Behavior Model, drawn out below. The basic premise is that getting anyone to adopt a behavior into their own lives requires a careful combination of motivation, the person’s ability, and a trigger. For example, if you want someone to walk for 30 minutes a day, you can remind the person to walk for 30 minutes using an app, but if a) they aren’t able to at that time for some reason or b) they are not motivated to do so, then there’s no amount of badgering or incentivizing that will work. 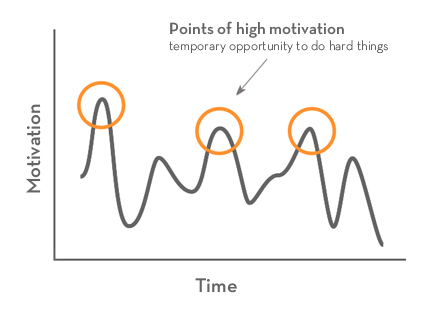 Careful designs will provide affordances for interaction even at points of low motivation, often in the form of “tiny habits” or small, very specific actionable behaviors. 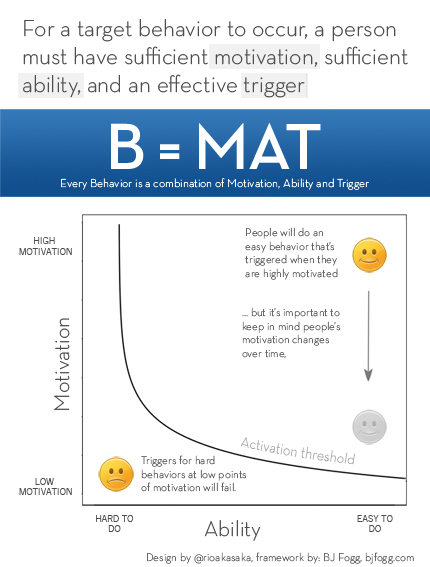 Most importantly, it is much easier to change a user’s ability to perform a behavior (going left to right) rather than change their motivations (going down to up) to do so. 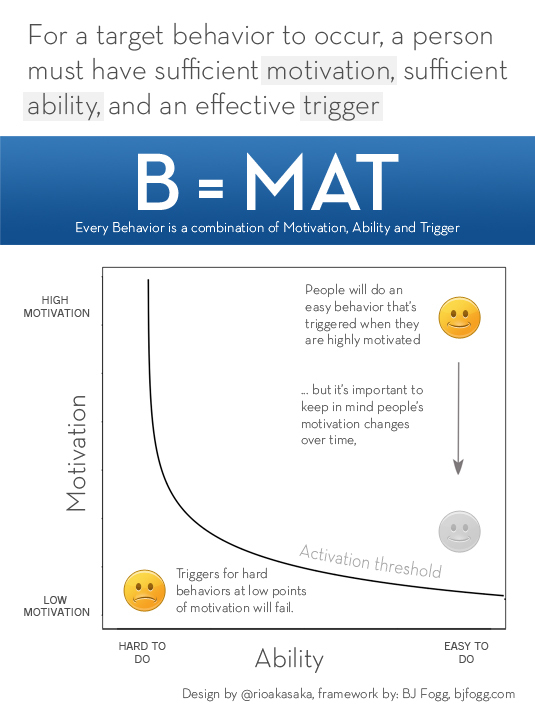 If a desired behavior fails, it’s because one of the three combinations (motivation/ability/trigger) has missed its mark. These results … hurt the people they originally try to help the most, because those users are incapable of maintaining desirable behaviors without technological solutions. This is why I remain skeptical about approaches in human-centered design that revolve around incentives as mechanisms for behavior change. Professor Balaji Prabhakar recently gave a talk about how incentive mechanisms helped Infosys encourage its employees to commute by public transport by offering cash rewards. The perennial problem is that putting a price on behavior can be a risky gamble to take. Incentives are fantastic for one-time behaviors such as filling out surveys or participating in research studies, but I have yet to see evidence of sustained behavior change through incentive mechanisms. A measure of effective behavior change would be to determine if the target behavior is adopted in the absence of the incentives or triggers (or calls to action). 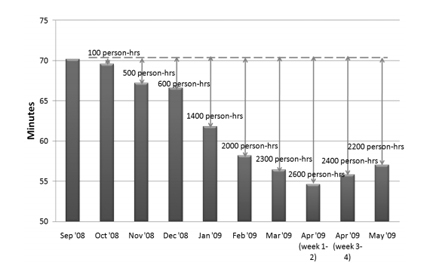 You might notice in the chart below from Professor Prabhakar’s paper that commute times have increased since the end of the pilot program (April ’09), for which no explanation is provided. The INSTANT project at Infosys Bangalore encouraged its employees to take group transportation buses, which reduced the number of commute hours spent – but only up to the end of the pilot program. Ambient displays act as triggers in the above behavior model, but their effect on behavior change is not well documented. For example, Jafarinaimi at CMU designed Breakaway a couple of years ago, an ambient display designed to encourage people who sit for long periods of time “to take breaks more frequently in a subtle and unobtrusive manner”. A two week study on one participant is hardly enough evidence of behavior change. Ignoring the Hawthorne effect can be particularly dangerous when we’re looking at changing people’s behaviors. Pediluma, a personal-public ambient light display attached to a shoe designed to “encourage users to engage in more physical activity”, showed promising results for 17 participants over a two-week period. Other implementations like the “show me” shower water consumption display saw a decrease in water consumption in four households over a period of 3 weeks. But the litmus test of success must be whether or not the amount of increased walking or decreased water usage is sustained after the removal of the device, and all too often I believe HCI researchers are afraid of the answers. For example, Follow-The-Lights, an ambient light installation designed to “lure and encourage people to take the stairs” showed that “in terms of whether people’s behavior changed as a result of the ambient influence approach, our findings appear to be conflicting”. Modeling: how to represent the data? Feedback: how to provide feedback? but you’ll notice that this approach is very skewed towards the technology, and not the user. The expectation is that given feedback, a user can take that information and act upon it, and the system would then subsequently reflect any changes in behavior. The Activity, Sensing and Modeling remain fixed. Ambience is often clumped together with ubiquitous computing, but I like to think that what is ubiquitous will very likely in some context be ambient, but what is ambient will not necessarily be ubiquitous. Systems like the Social Garden and UbiFit are fantastic in premise but show no promise in longer-term behavior change. This can be attributed to the fact that ubiquitous systems assume that users would be engaged in the technology when they are highly motivated – displaying the same material at times in which we are not motivated can potentially backfire. You’ll note that providing affordances for any of these 3 ensure that even in the absence of that technology, the target behavior can still be performed. 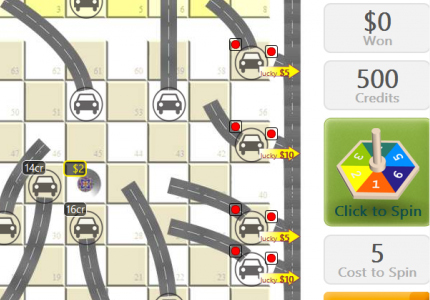 Games give their players meaningful choices that meaningfully impact on the world of the game. and that by extracting “the thing that is least essential to games and representing it as the core of the experience”, the whole process should be called pointsification, rather than gamification. Pointsification devoid of the gaming features (gaining ability of some kind) is very likely to fail. What’s dangerous is for the HCI community to focus on successes in short-term behavior changes that depend on incentives and feedback mechanisms. While these results may earn accolades and publications, they hurt the people they originally try to help the most, because those users are incapable of maintaining desirable behaviors without technological solutions. While longitudinal studies are hard to conduct, we as researchers need to remind ourselves that technology must act as enablers, not solutions. The technology we have presently allows users to not merely be consumers of information/feedback but rather active agents in the process of their own behaviors. I therefore propose an alternative representation of Forlizzi’s model, as shown below. 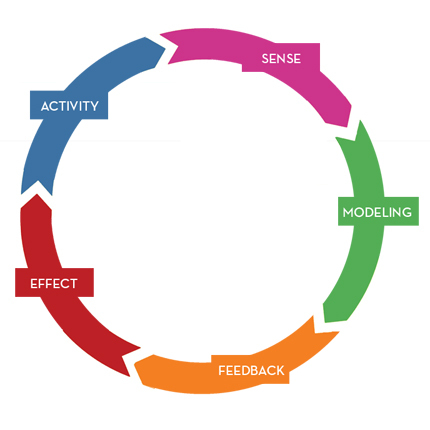 In this system (which we called self-shaping), a feedback system allows users to affect the Activity, the Sensing and the Models that the system initially has. For more concrete ideas, let’s consider an example application designed to encourage users to consume less water at home. The system may initially reflect the current amount of water usage at the home using some metaphor. However, the system can also recognize that the user’s behavior in some way has changed such that as a result of the system, it notices a couple of days in which the user decides against running water while brushing their teeth. The system then highlights that behavior by displaying only information related to running water less in the bathroom, or allowing the user to decide what prompts or triggers might serve as the best method to encourage future behavior. These triggers may very well be informational – contextualizing behavior such as the amount of water saved in terms of money saved or carbon footprint saved may work well. The feedback then no longer acts simply as a window into a user’s behavior, but also as a scaffold for future behavior. The exciting challenge in HCI then becomes how to accurately represent the fact that the technology is reflective of the user’s present behavior. Long-term behavior change must be framed in human computer interaction as using technology to empower users to make future behaviors easier to do. This entry was posted on Saturday, November 17th, 2012 at 11:27 pm, EST under the category of Articles. You can leave a response, or trackback from your own site.